Recipient of the 2017 Ivor Novello Lifetime Achievement Award, Artist, producer, songwriter, club DJ, broadcaster, multi-instrumentalist, orchestral composer and cultural tastemaker. Nitin Sawhney has scored over 60 films, and has a host of awards to his name. 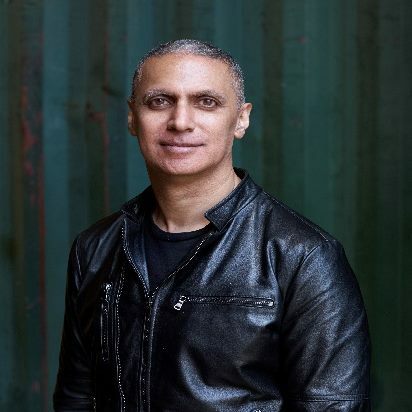 As well as releasing 10 studio albums he has produced for many acclaimed artists from Sir Paul McCartney, Sting, Joss Stone, sitarist Anoushka Shankar and classical pianist Helene Grimaud, as well as producing his own radio series on BBC Radio 2 – Nitin Sawhney Spins the Globe. Nitin has also worked extensively with theatre, composed for video games and produced music for dance choreographed by the internationally acclaimed Akram Khan. Film credits include scoring for Andy Serkis’ directorial debut movie Breathe. October 2018 sees the release of Warner Brother’s multi-million dollar feature film: Mowgli, directed by Andy Serkis of which Sawhney has written, composed and produced the entire film score. Nitin’s most recent album, Dystopian Dream, continues to be a fully choreographed international show produced by Sadler’s Wells. While 2019 marks the 20th anniversary of Nitin’s acclaimed album Beyond Skin.